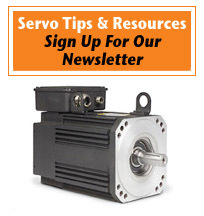 Servo motors are small and efficient but critical for use in applications requiring precise position control. The servo motor is controlled by a signal (data) better known as a pulse-width modulator (PWM). Here are several of the more common servo motor applications in use today. Robotics: A servo motor at every "joint" of a robot is used to actuate movements, giving the robot arm its precise angle. Conveyor Belts: Servo motors move, stop, and start conveyor belts carrying product along to various stages, for example, in product packaging/bottling, and labeling. Camera Auto Focus: A highly precise servo motor built into the camera corrects a camera's lens to sharpen out-of-focus images. Robotic Vehicle: Commonly used in military applications and bomb detonation, servo motors control the wheels of the robotic vehicle, generating enough torque to move, stop, and start the vehicle smoothly as well as control its speed. Solar Tracking System: Servo motors adjust the angle of solar panels throughout the day so that each panel continues to face the sun, harnessing maximum energy from sunup to sundown. Metal Cutting & Metal Forming Machines: Servo motors provide precise motion control for milling machines, lathes, grinding, centering, punching, pressing, and bending in metal fabrication for such items as jar lids to automotive wheels. Antenna Positioning: Servo motors are used on both the azimuth and elevation drive axis of antennas and telescopes such as those used by the National Radio Astronomy Observatory (NRAO). Woodworking/CNC: Servo motors control woodturning mechanisms (lathes) that shape table legs and stair spindles, for example, as well as augering and drilling the holes necessary for assembling those products later in the process. Textiles: Servo motors control industrial spinning and weaving machines, looms, and knitting machines that produce textiles such as carpeting and fabrics as well as wearable items such as socks, caps, gloves, and mittens. Printing Presses/Printers: Servo motors stop and start the print heads precisely on the page as well as move paper along to print multiple rows of text or graphics in exact lines, whether it's a newspaper, a magazine, or an annual report. Automatic Door Openers: Supermarkets and hospital entrances are prime examples of automated door openers controlled by servo motors, whether the signal to open is via push plate beside the door for handicapped access or by radio transmitter positioned overhead. The world would be a much different place without servo motors. Whether they're used in industrial manufacturing or in commercial applications, they make our lives better, easier, and in many cases provide us with more affordable products.